There is a perceived impossibility to writing after Beckett. When everything has been winnowed away, what can possibly be left? And yet life is left. At the end of what is the word we did not all disappear in a cataclysmic puff of smoke. Art is left. Paintings have been made, books written, sonatas composed. And, of course, Beckett is left. To be re-evaluated, re-interpreted, sanctified, vilified and all the -eds and -ieds that are applied to any artist worth their salt, eventually. So, impossibility is not an option or even a reality. Nor, it seems to me, was it ever the point. However, there is a lumpen strain of criticism which demands an influence may not be mentioned without the mentioner immediately having their work laid out against the stated influence, measured for linguistic similarities, alignments of world view, even comparable formal experiments and, traditionally, be found wanting. This is the monster in Beckett’s legacy, not Beckett and not his work. Influence is the unquantifiable, often unverifiable, benefaction of art. No writer, no matter how scrupulous, can control how their work is read, interpreted or absorbed into the imagination. For the assumption therefore, to be that naming Beckett an influence is an attempt to stake a claim on his territory, and in precisely the same way he did, displays a fundamental misunderstanding of how literary influence operates. It has become a notion so pernicious, and deleterious to the creation of new work, that it deserves to be slain. Beckett does not cover all life, everywhere. He does not write towards the universal -and indeed, any writer’s attempts to do so invariably result in generalised mush. Rather, it is by working assiduously within his own philosophic, linguistic and formal boundaries that his great universality is achieved. Neither Beckett, nor his work, forbid or negate alternative approaches to the concerns he spent his writing life grappling with. He does not pull the ladder up after himself. It is merely a didactic -and, alas influential – strand of literary and academic criticism which insists all writers coming after have no right to climb. 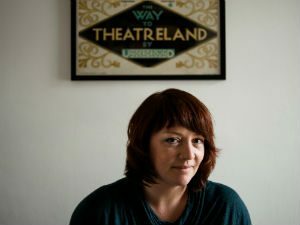 Multi-award-winning author Eimear McBride is Reading’s first Beckett Creative Fellow, and has been given unique access to our internationally important Beckett Archive – the largest collection of publicly accessible Samuel Beckett materials in the world. This is her latest monthly journal entry about her experiences of working with the materials.